It’s true that golf doesn’t have the most stylish of reputations. Argyle jumpers paired with shapeless slacks may cut a fine silhouette at the local British Legion, but these do little to represent modern menswear. Style ambassadors such as John Daly and Trainspotting’s Francis Begbie have done little to aid the cause. But this hasn’t always been the case. Timeless classics such as the Harrington jacket were conceived as golf attire, while brands such as Lyle & Scott and Pringle of Scotland made their names at the tee. Back further still, knickerbockers and plus-fours were the mark of Victorian sporting sophistication – employing garish socks to show a flash of personality in an otherwise mundane outfit started long before City Boys adopted it. Now, a new breed of brands are bringing golf attire up to date. Galvin Green, J.Lindeberg and Loro Piana are making a runway out of the fairway, using a range of fabrics that are weather-ready and cut in styles that allow a full range of movement, while still looking good. Heritage fashion houses such as Dunhill Links produce seriously high-end lines using luxury fabrics, while the likes of Adidas and Nike make golf shoes that could easily keep a sneakerhead happy for 18 holes. Allow us to introduce you to a golfing wardrobe that keeps you in play both on and off the course. “This is the most common faux pas at the moment and has become the biggest talking point among golf style experts,” says Andy Coulter of golfing style website, Golfposer.com. “A player can be wearing the most stylish shirt, trouser and shoe combination but a horrendous white belt can ruin all that.” However, there are times when it can be acceptable. White belt with white trousers? Tick. White belt with white shirt. Tick. White belt with anything other than white trousers or a white shirt. Just don’t do it. “Most people have an idea of what they think that golf style should be. They get it wrong at this point,” says Jens Werner, creative director at J.Lindeberg. “Style is style. Your golf clothing should be good enough to wear in a social situation.” Do you prefer a slim-cut trouser in day-to-day life? Plenty of golf brands such as Ping offer this. Wide shoulders? FootJoy makes affordable ‘athletic’ fit golf polos that offer a more modern cut than the shapeless square shirts of old. “Many golfers get it wrong with the number of items they put on in the morning,” says Mats Lundqvist, creative director at Galvin Green. “Too many mix a range of fabrics that are not compatible in terms of breathability and they’ll end up hot and bothered no matter what the weather.” While manmade fabrics are now par for the course for their increased breathability and sweat-wicking properties, many don’t interact well with one another. If you’ve got a manmade fabric base layer or polo shirt, think about a natural yarn such as merino to overlay. “Pay attention to how your outfit flows,” says Coulter. “Never wear pattern on pattern. Just because you have a beautiful argyle jumper and a pair of classic plaid trousers that you paid big money for, it does not mean that they’ll work together.” If your polo features an accent colour or flash of branding, match this in another area of your outfit, too. Black trousers, like black jeans off the course, are always a solid bet. Golf has more headgear options than any other sport. The flat cap was popularised by golfers in the late 19th century for both warmth and its aesthetic appeal and has since spawned myriad millinery options for the style-conscious golfer. Baseball caps are industry standard and offer the most variety in terms of colour and branding. We’d suggest going with white – it works with almost any outfit – and Titlelist offers huge range of coloured caps with a handy ball marker. Rocking a visor can pep up an otherwise understated outfit; just ask Luke Donald. But never, ever go for a SnapBack. It doesn’t work for Tony Finau and it certainly won’t for you. While the traditional golf jumper has gone out of fashion with the current breed of professional players (they choose instead to garner warmth from baselayers), there’s still plenty to choose from for the club golfer. We’d advise against going for Ralph Lauren cardigan and tie combo that Justin Thomas wore at The Open in 2017 and instead keep it classic. Kjus Golf uses high-quality merino wool for its knits, which is quick-drying, breathable and helps to regulate body temperature. For around £150 it’s a classic range that will never go out of fashion, unlike that jacquard number you invested in a decade ago. This is where the price point can really start to rise. Jackets and shells imbued with Gore-Tex, cashmere and new-fangled waterproof materials can regularly tickle the £400 mark, but the very best are so breathable that they can be worn year-round. “You need to find something where you can complete a full swing with zero restriction,” says Lundqvist of Galvin Green. Golfers’ swings are unique, so what might feel comfortable to one player may not work for another. Always try outerwear on in a golf shop that has clubs available so you can complete a full swing with the jacket on. This does not give licence to go full Love Island. Your playing partner does not want to see what you had for breakfast. The world’s best sneakers are also finding their way to the golf course. Adidas has shoes which look identical to Stan Smiths, Nike has Flynknit golf shoes and brands such as Duca has catwalk-grade brogues that look good enough to wear with a suit. 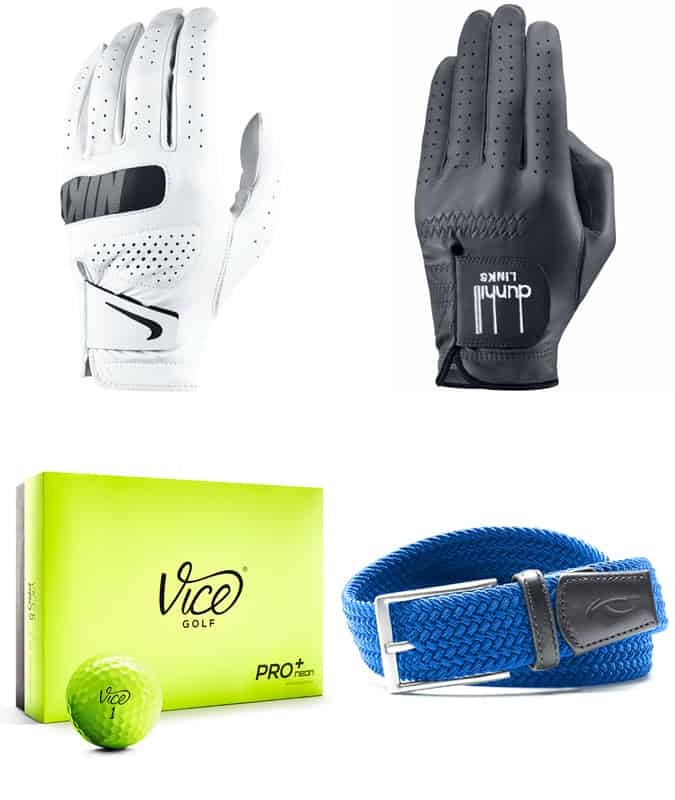 From the glove your wear to your choice of balls and tees, when you’re lining up on the first for a corporate golf day, there will be at least a minute when all eyes are on you. The accoutrements are big business in golf so are well worth good and proper consideration. Vice Golf has created a range of balls to suit players’ swing speed – anyone in the know will recognise this from the moment you tee it up. Pure leather gloves offer the most grip, but are poor in wet conditions. Always pick wooden tees in a colour that matches your glove. They guarantee a cleaner ball-strike, too. Like it or loathe it, you’re going to be judged from the moment you meet in the clubhouse for cold bacon rolls and stewed coffee. Think about every element of your look just as you would your business-casual office uniform. Bring a bootbag for your golf shoes and make sure your jacket for the post-round lunch is in a suit carrier. Keep it classic out on course – you don’t want to be that guy who cards 100+ wearing the rascal shirt your girlfriend got you for Christmas. Galvin Green, J.Lindeberg, Kjus, Adidas Porsche Design Sport, Hugo Boss and Ecco shoes are the brands to employ here. They use the most-modern cuts, subdued hues and the very best materials. Some of the tour players pull off heritage style with aplomb, and it doesn’t involve knickerbockers and argyle socks. Instead, they sport neutral colours and allow the fit and interesting fabrics do the talking. Spanish maestro Seve Ballesteros managed this every time he walked on the course. In terms of brands, check out Dunhill Links, Pringle of Scotland and Ralph Lauren. They might cost more than you want to spend immediately but will stand the test of time. Just think of the cost per wear. A golf day with friends is where you can really put your stamp on a look. You’re with people who won’t judge (any more than they already do) so open up those shoulders and put on a bit of a show. “One of our favourite colour combinations right now is black and orange,” says Coulter. “Introducing a pop of colour into an otherwise neutral outfit is a great idea and will make you stand out, without looking ridiculous.” Just channel Adam Scott and his great-value range for Uniqlo for inspiration. 4) Invest in quality waterproofs. You will play your best golf if you’re feeling comfortable. This can’t happen when you’re wet through. A set of quality wet-weather gear will last decades and never go out of fashion. Galvin Green sets the bar for these. Its new Interface-1 top is designed to be worn on 95 rounds out of 100. It’s windproof, water repellent and extremely breathable. 5) Consider the cut and follow the leaderboard. “The shape of golf apparel has changed drastically in the past few years,” says Jensen. “We now produce much slimmer silhouettes that look far closer to fashion trends.” If you wouldn’t wear something out with friends on a weekend, don’t take it to the golf course. And if you’re struggling for inspiration, just follow the guys doing it best.